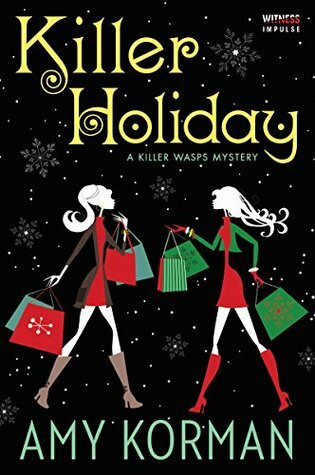 Goodreads: Kristin Clark and her offbeat crew of Bryn Mawr pals are ready for a festive holiday—one that involves sipping Blitzen’s Bourbons by a yule log, hot guys beneath the mistletoe, and a holiday cabaret starring ex-Mafia wife Sophie Shields. But this year, Saint Nick has something more dangerous in store. A stranger dressed as Santa has Kristin’s friends on his naughty list. First, Sophie’s favorite handbag is blasted by a bullet. Then, Father Christmas shatters local golf-shop owner Chip Delaney’s car window with a 5-iron and leaves a threatening note demanding $50,000. When Chip goes missing, the stakes become deadly. Much-hated Powerball winner Eula Morris is also back from a luxury cruise, more boastful than ever and toting a handsome new boyfriend (who looks oddly familiar), as well as a Samsonite filled with gold bars. When the suitcase is snatched, Eula implores Kristin and the gang to track it down. Is Chip on the run, or was he kidnapped? And who stole Eula’s gold? The Killer WASPs and Kristin’s basset hound, Waffles, are on the case—before this white Christmas turns dark . . .
Kritters Thoughts: Just over novella length, this short book is the final in this series for now. Kristin Clark owns an antique store that isn't doing well, so she ends up spending her time solving mysteries in this Pennsylvania town. Along with her large cast of characters they end up embroiled in one another's messes and antics. As I mentioned yesterday it was some time between reading book one and two and then reading three and four. I had the same feeling when I read this book as the previous. They felt less edited and finessed than the previous two. I don't that it is particularly the book's fault or more my reading tastes have changed. I did seem to like the mysteries that were needing solving more in this book compared to the previous and felt as though the adventure was just a bit more fun. I am glad to have finished the series and I am not sure if I would revisit if there are more to come.